Osaka: Thailand’s investment is expected to grow by 10% in 2020, largely driven by outlays to the government’s flagship Eastern Economic Corridor (EEC). Air quality in Bangkok and surrounding provinces improved on Sunday morning with readings ranging from moderate to very good levels, according to the Pollution Control Department. Traffic police have expanded the number of teams screening vehicle exhaust emissions amid the worsening smog situation in Bangkok and its vicinity, and are considering stricter regulations on exhaust quality. Authorities have impounded 130 lorries and buses that were found to be spewing black exhaust smoke in excess of the safety limit in 15 provinces leading to Bangkok. For visitors, stepping into “Lan Mai Thai”, a small tree shop operated by Manee Siripalika in Min Buri district near Chatuchak 2 Market, is like walking into an oasis. The United Nations has launched Thailand Migration Report 2019 which indicates that Thailand has achieved considerable progress in migration management and is well positioned to maximize the benefits of migration if more is done to ensure the welfare and protection of migrants. New housing loans are expected to shrink by 10% this year, dragged by the central bank’s stringent mortgage lending rules and weaker condominium demand from Chinese buyers, says a senior executive at Bank of Ayudhya (BAY). The Stock Exchange of Thailand (SET) plans to instigate a three-year strategy to handle global economic volatility, using the bourse as a platform to increase investing efficiency and generate digital savings. A new wave of call centre scams is targeting the elderly, according to bank sources. Cambodian and Thai central banks on Sunday signed a Memorandum of Understanding (MoU) on cooperation in QR-code based payment scheme and financial innovation, said a National Bank of Cambodia (NBC)’s statement. Police have arrested five people who showed up at Government House to call for the prime minister to resign. Ten immigration policemen in Sa Kaeo and Pattani have been sidelined pending an investigation for allegedly letting Cambodian men enter the country illegally. Camo-clad rangers ambush a camp in a lush Thai national park, kicking away a machete and a firearm and pinning two suspected poachers to the ground – part of a training exercise to counter a lucrative wildlife trade. The National Council for Peace and Order (NCPO) continues to extend its term as Thailand’s longest coup regime since the 1960s. Prime Minister Gen Prayut Chan-o-cha has reported on his administration’s performance in its fourth year in accordance with the national strategy. As the island’s animal welfare officials struggle to cope with rolling out a mass rabies vaccination campaign and the rounding up of any dangerous dogs on the island, they are enlisting the help and support of Phuket’s renowned Soi Dog Foundation. The Prime Minister has proposed the Southern Economic Corridor (SEC) and the Food Innopolis projects, deeming they will play a vital role in stabilizing the Kingdom’s economy by utilizing the nation’s natural resources and its agricultural practices. Prices of consumer goods remain unchanged ahead of the Spring Festival, the Department of Internal Trade has announced. PTT Plc, the national oil and gas conglomerate, together with five subsidiaries is allocating a 2019 budget for all business expansion worth a combined 450 billion baht. The Election Commission (EC) has prepared a space on the second floor of its headquarters to register MP candidates and proposed Prime Ministers starting this February 4th, while Bangkok authorities have decided which roadways and connecting sois can be used for the placement of campaign posters. The National Legislative Assembly (NLA) has passed into law the draft Ethical Standards Bill which provides civil servants, state authorities, and governing bodies with ethical guidelines. DOCTORS have urged people not to burn joss paper as offerings and limit incense-burning during Chinese New Year celebrations this week to prevent hazardous emissions. Thailand, Japan and Singapore top the list of destinations for Chinese travellers this Chinese New Year. Thailand weather: Is it safe to travel to Bangkok during toxic smog cloud? Thailand’s capital is under siege from a dangerous blanket of dust particles which is deemed to have reached dangerous levels. The lack of public interest in a policeman shooting dead an unarmed citizen on the streets of Phuket this past week is plainly disturbing. Is that what people in Phuket consider as run-of-the-mill in 2019? 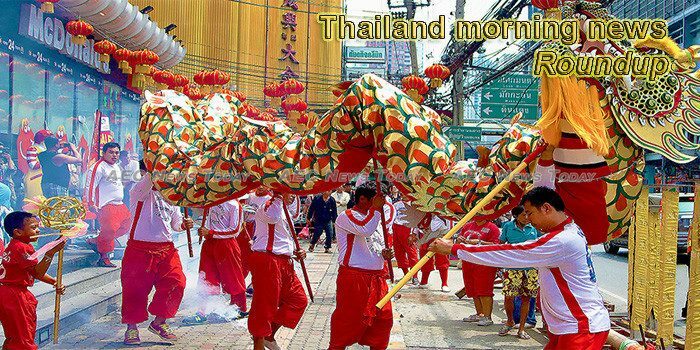 The University of the Thai Chamber of Commerce (UTCC) forecasts 58 billion baht will be spent on Chinese New Year festivities. After a short confrontation with conservationists and local southerners late last month over the controversial Wang Heeb dam project in Nakhon Si Thammarat, the Prayut Chan-o-cha government has agreed to step back, albeit temporarily. The Office of SMEs Promotion (OSMEP) has upgraded its mobile application “SME Connect” to better educate SME operators and improve their operation. Maxim Frolov, vice president of global sales for Kaspersky Lab recently sat down with The Nation Weekend to share his perspectives on cybersecurity in 2019. Major drug hauls involving 760,000 methamphetamine pills and 500 kilogrammes of compressed marijuana have been made by police under the Region 3 Provincial Police Bureau, deputy police chief Pol Gen Chalermkiat Srivorakhan said at a briefing on Sunday. Anantara Hotels Director of Operational Excellence & Events Tim Boda has announced Thailand’s first “Elephant Boat Race & River Festival” to be held between March 29 – 31, 2019.